Do you know how much you spend every month? If you work with a budget, then you will likely have a pretty good idea what goes out every month. Even if you do know the total amount of your expenditures, you might not know exactly where the money goes. Often, many people are surprised by how much they spend on non-necessities, such as eating out, entertainment, driving needless miles, picking up a magazine, or more. Today it’s easier than ever to purchase an item without considering it a major expense, only to discover at the end of the month you’ve thrown away hundreds, if not thousands, of dollars. We propose that you ditch the word, BUDGET, and start using SPENDING PLAN. We have all heard the saying, "It takes money to make money". Well, how are you using your money to make you money? Every little bit counts, we have to spend money, so might as well spend it where it will benefit our families the most. O - Print out an account statement for the last 30 days from your checking account and/or credit cards. 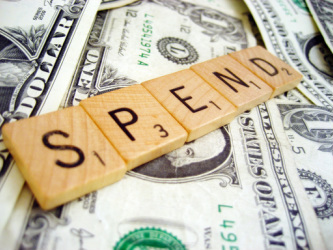 (Include any accounts that you use on a regular basis for spending). O - Use a highlighter to highlight expenses that could easily be avoided or reduced. O - Add up all the items highlighted then multiply by 12. Your answer should give you a rough estimate of how much money you could use towards your financial goals every year.